Several defense and economic related news items involving Japan and Southeast Asia have emerged over the last few days, but chief among them was the announcement that the Defense Ministry is sending the Maritime Self-Defense Force (MSDF) transport ship Kunisaki to the South China Sea to participate in international response drills, according to Japan News. A senior military official categorized the deployment as training for humanitarian assistance, and said that it was not a military exercise. The significance of the deployment is that the Kunisaki will be transporting around 140 Australian and U.S. personnel, who will be participating in search-and-rescue drills in the Philippines, Cambodia and Vietnam. The Japan News article states this will be the first time a MSDF ship will participate in such a task while carrying up to 100 Australian and U.S. troops, and that the ship will participate in drills to “confirm the procedure of medical assistance in the event of a major disaster.” Providing logistical assistance to Japanese allies in scenarios that likely include a threat to Japanese interests is exactly the type of “grey zone issue” Prime Minister Shinzo Abe wants his Cabinet to clarify in the Constitution. On Tuesday, Japanese Self-Defense Forces chief of staff, General Shigeru Iwasaki, met with Myanmar army chief Min Aung Hlaing as part of a four-day trip to the country. This is the first time since the Second World War that Japan’s highest-ranking army officer has visited the country. He is also scheduled to meet with President Thein Sein, who signed an investment treaty with Abe and received loan promises of up to $600 million in a visit last December. In January, Japan forgave Myanmar $3 billion in debt. On Monday Japan promised an additional $5.89 billion in Foreign Development Assistance for Myanmar’s western neighbor Bangladesh, whose prime minister, Sheikh Hasani is currently on a four-day visit to Japan. Hasina has asked for help on a number of infrastructure projects, and part of the package will go to build a 1,200-megawatt power plant. The Bangladeshi prime minister also met with Japanese Emperor Akihito. Finally, in news slightly closer to home, the Japan Times reported that residents in Okinawa have lost an appeal over an environmental impact assessment concerning the relocation of the U.S. Marine Corps’ Futenma Air Station to the city of Nago from Ginowan. While the environmental assessment was a small skirmish in a larger battle by local residents to keep the station out of their town, it shows steady progress toward redeploying and modernizing the U.S. base of operations in Okinawa. This is important for the future of the U.S.-Japanese alliance, as forces deployed in Okinawa provide critical air support for the East China Sea and portions of the South China Sea. While some of these items are likely connected, others clearly aren’t. Nonetheless, it is interesting to view them as a whole. 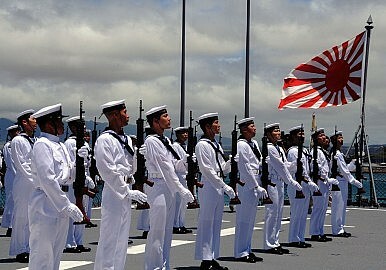 Japan is clearly reinforcing a two-pronged approach to increasing its influence in the greater Southeast Asian region. Through investment, military involvement, and even its courts, there appears very little pushback within the government against Abe’s plans to tie Japan closer to its regional partners. Closer economic ties to the region are certainly not controversial in Japan, although they may raise eyebrows in Beijing. However, new types of MSDF deployments, which are similar to “grey zone issue” contingencies Abe would like to see enshrined in the Constitution, could be. Likewise, sending the SDF chief of staff to Myanmar for the first time since the Second World War is symbolic. Whether either of these issues becomes significant remains to be seen, but it is probably unlikely. Much like the citizen’s loss of their appeal in Okinawa, these are incremental steps in a long-term strategy. Economic incentives, in the form of investment and debt forgiveness, are also key to this strategy. Both Japan’s allies and its rivals will watch as this two-sided approach continues. Rivals like China will not miss a chance to compete in investment, and paint Japan as a country forsaking its pacifist Constitution. Countries like Myanmar on the other hand, which are seeking to balance their dependence on China, will continue to cautiously develop ties with Japan, in the hopes of gaining more autonomy in their own economic and security spheres.